Line 24 muffin cups with paper liners. Set aside. For the cupcakes, blend together the butter, sugar, brown sugar and molasses in the bowl of a stand mixer until light and fluffy. Add flour, ginger, cinnamon, nutmeg and cloves. Slowly blend until batter is smooth. Fill each muffin cup 3/4 full with batter. Bake for 22 - 25 minutes or until a toothpick inserted into the center comes out clean. Set aside to cool. For the frosting, place the cream cheese, cinnamon and vanilla in the bowl of a stand mixer. Blend until smooth and fluffy. Add in powdered sugar and cream. Slowly blend until all of the powdered sugar is incorporated. Then, turn up the speed and continue blending until fluffy. 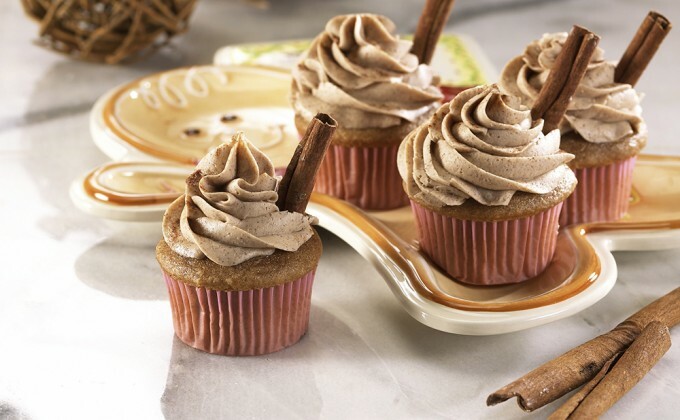 Spread frosting on cooled cupcakes with a knife or pastry bag. Arrange on your temp-tations® Gingerbread Platter to serve.